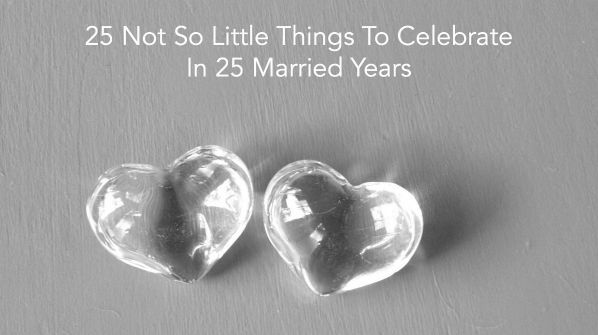 My marriage is 25 years old this week. What would I whisper in that bride’s ears if I could? What would I tell her that she would be grateful for these 25 years later? It would be the little things. The smiley-face post-it notes left in your car, reminding you not to plow into a guest’s vehicle parked in the driveway. Which you have done. Twice. The iced water left for you by the back door, after a hike on a sweltering summer day. The way he reaches out his hand when you are attempting to inch down a steep slope. He has learned what a klutz you are. And remembers. How he somehow changes light bulbs before you do. The extra Kleenex he had in his pocket at your mother’s funeral. The specially-adapted wheelchair he found at the beach when you were on crutches, so you could play in the sand with your son. How he has learned to like pesto. And theatre. And, although a Jersey boy and dedicated New York Giants fan… your beloved Dallas Cowboys. The ritual of putting silly stuff, carefully gift wrapped, in your stocking at Christmas. Like a bottle of tarragon. Or soap from some hotel. Which you already owned. And how he gets tickled every year, watching you open them. How he strings the lights on the Christmas tree. And then busies himself as the rest of us put on the ornaments. Because it makes him too emotional. How he grumbles about how messy your car is, as he pulls out a Taco Bell sack and other mysterious bags of whatever you had for lunch over the last week. How he laughs at you, jumping up and down, to fit into a pair of jeans. His consistent words of encouragement when you decide to go for something. His sitting and delightfully playing with anyone under the age of six. Any game they want. The solid belief that you could get pregnant. After three years of infertility treatment. And a miscarriage. Laughing with you, whenever possible, during that entire process. The tears in his eyes after your son was born. The slight panic he had when you left him alone with the baby for the first time. And when you came home, the baby was screaming. He had changed him, rocked him, tried to hold him. Only had forgotten… to feed him. The tears in his eyes when you left that son at college. The extra Kleenex he had for you on that same occasion. How he makes fun of the way you talk with your retainer in. His attendance at multiple theatre productions. Whether they were good or not so hot. You were in them, and he was there. His careful attention to people in the generations older than yours. His screaming at the squirrels in the bird feeder. His courage in facing his own cancer. How he has grown through that process. How you have become closer in many ways. Also not a little thing. Your marriage won’t be perfect. There will be arguments and misunderstandings. There will be things that you don’t have a clue about yet that will irritate the heck out of you. And you will be no shining star yourself all the time. 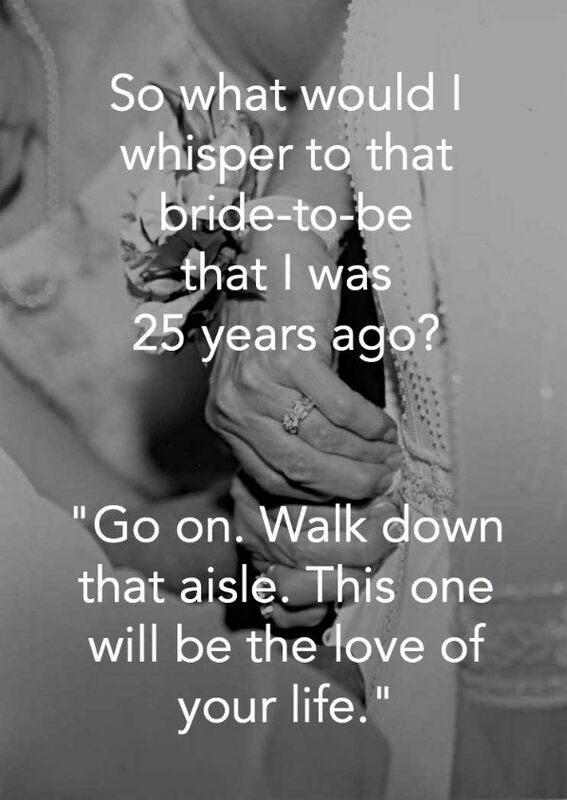 So what would I whisper to that bride-to-be? If you are a woman, please take this 5 minute, 10 question survey! Only 4 more days to fill it out. My tremendous thanks to you! Just click here! Thank you for reading! SUBSCRIBE to my website in the gray box above and receive a free copy of my eBook, “Seven Commandments Of Good Therapy”, a guide to evaluating a potential therapist or current one. You can also privately contact me: askdrmargaret@146.66.99.73. Photos of hearts by Deborah Strauss and of the bride by Christine Mathias.